Here’s the lamp in our mood board for our office re-do. It’s a steal for only $19.99 at Target. 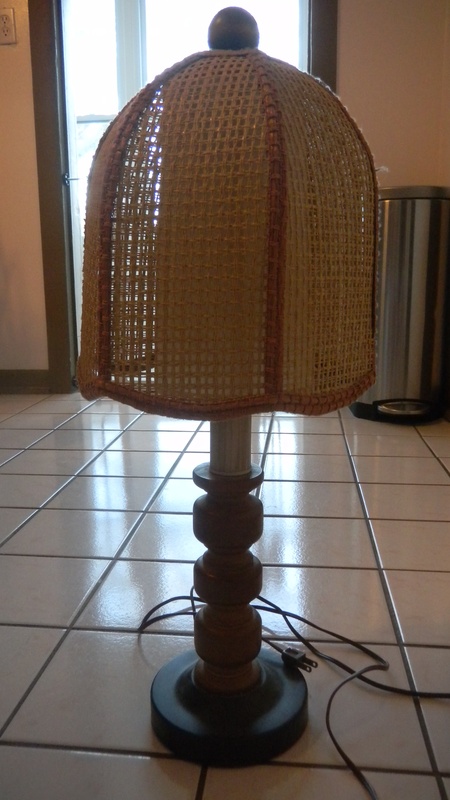 I was ready to get into my car to pick one up when I remembered that my parents had an old wooden lamp from the ’60’s that would look quite similar if given a new lamp shade (I didn’t even know wicker could be used in a lamp) and a lick of green paint. I’ve really been trying to make an effort to be eco-friendly lately, so I knew the lamp would be a great way to reduce, re-use, and recycle. As an added bonus, I was glad to have an item that my grandparents bought and used, my parents used, and I would be using it too. Who doesn’t like a little history in their home furnishings? 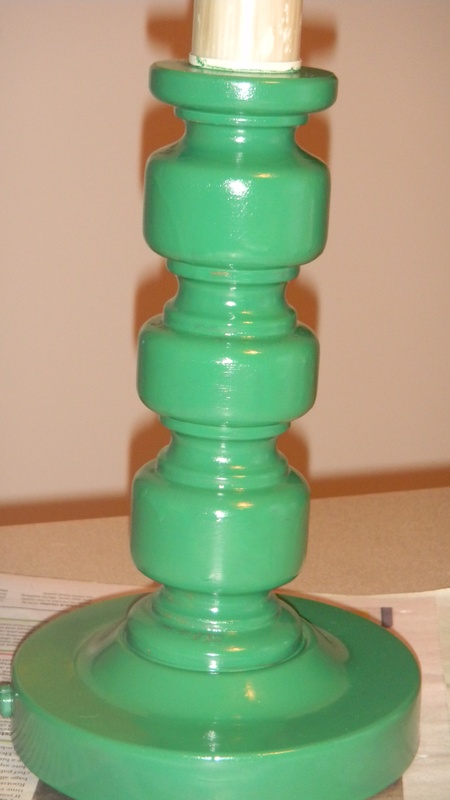 Once my dad found the old lamp in his basement and gave it to us, we began the transformation. Here’s what we had to start. We bought some green spray paint from Wal-Mart. 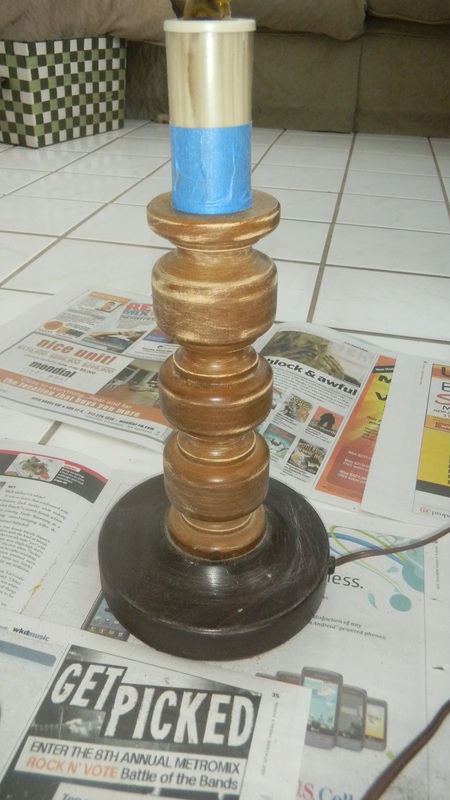 Dan sanded the wooden base of the lamp so the paint would stick to it better. A little painter’s tape to keep the electrical cord and the light bulb base from being turned green, and spray painting, here we go. 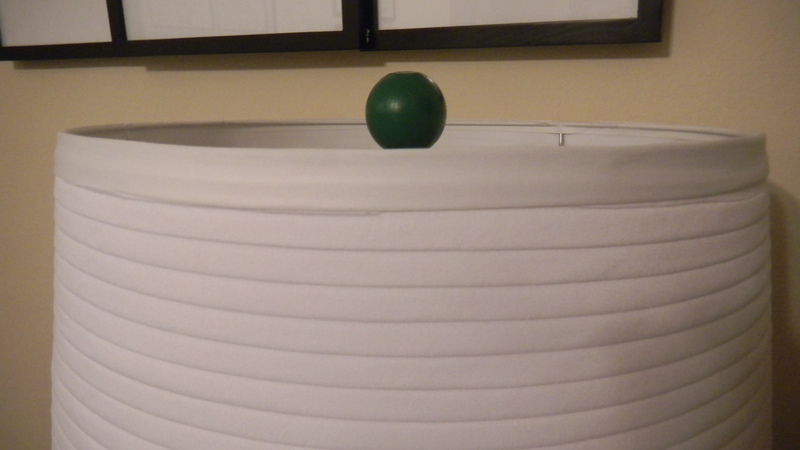 I think my absolute favorite part of this lamp has to be the cute little ball on top. It kinda reminds me of the cherry on the top of a sundae. And who doesn’t think the cherry is the best part? Of course, Dan made sure to spray that guy till he was fully green too. 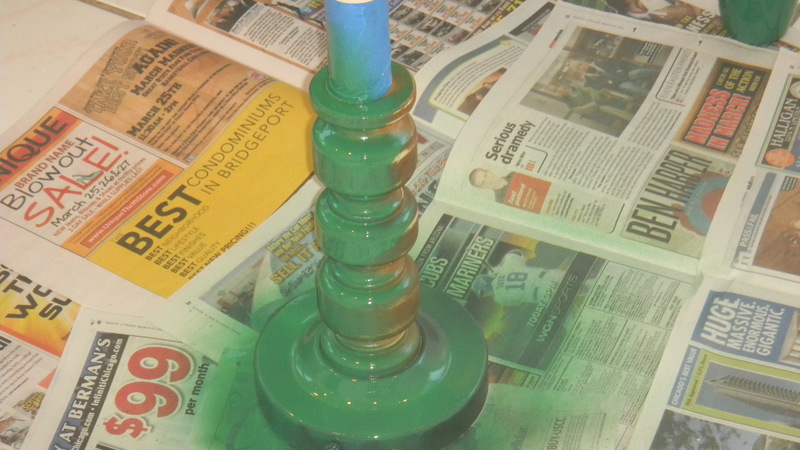 We let the paint dry, and wow, it’s green. I next turned my attention to finding a lamp shade since Dan assured me there was no way to salvage the shade we already had. Our first purchase was this lamp shade from Target. It was the right size, right shape, right color, but when we got it home we realized it would not work. The ring that you use to connect the shade to the lamp didn’t fit. 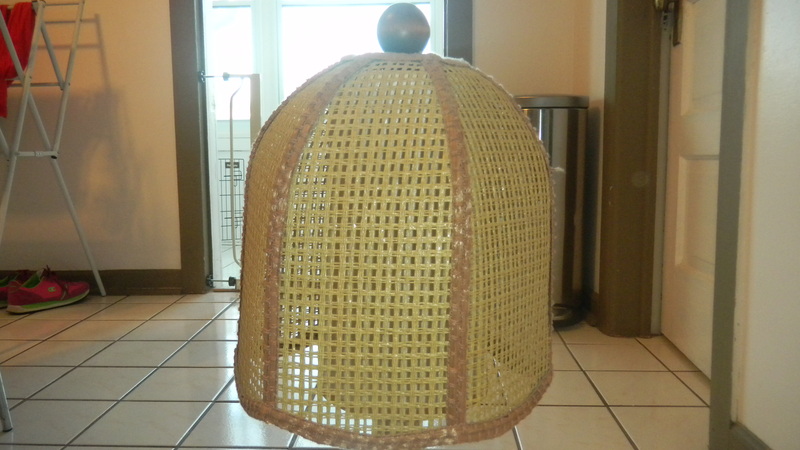 Apparently, if you have a cute little ball on the top of your lamp, you need a special kind of lamp shade. Good to know. While out on some errands one night, I asked Dan to pull over so we could stop at Homegoods. We were in luck! We found a white lamp shade and it had a bit of a twist. The shade had pleating, but instead of the vertical pleating you usually see, this pleating went horizontally. Love it. The shade fit! Pretty good deal for $12.99. Here’s the finished product. What do you think? Is it pretty close to the original lamp? I do worry a bit about the color. It might be too emerald green and not lime green enough. 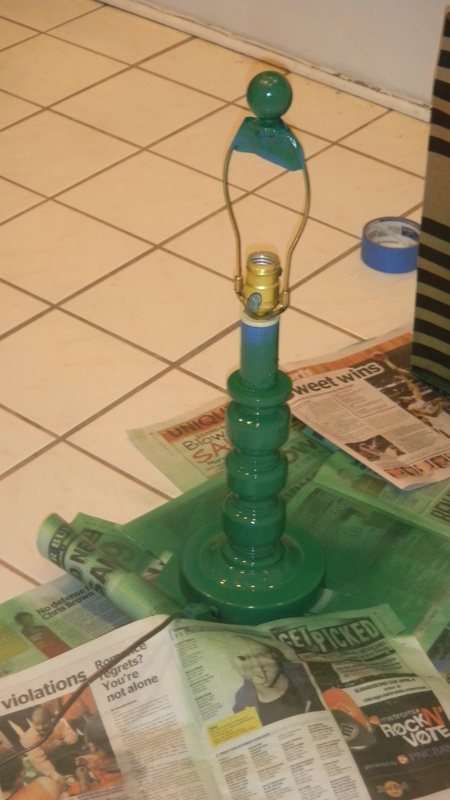 I’ll see how the room progresses and if this lamp sticks out like a sore thumb, we’ll just repaint it. 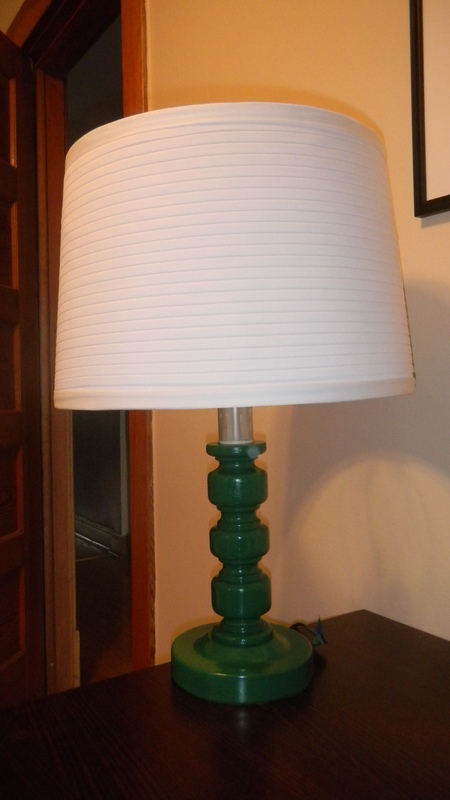 While refinishing the lamp didn’t save us much money (because the lamp we liked was so cheap to start with), it makes me happy to have taken something old, and turned it into something new. Ugh…customer service. I was stuck in a long line the other day and I was ready to lose it.Is that an invite to Maryland? I might just take you up on it!Thanks for reading!